We are extremely proud to announce that the Dalmunach Distillery project won the 2016 RICS ‘Highly Commended’ award under the category of ‘Design through Innovation’. 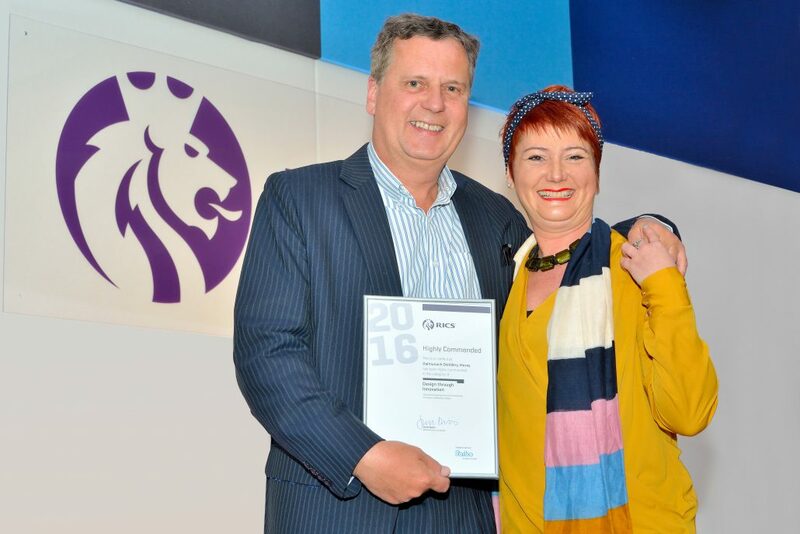 Thomson Bethune’s Managing Director, David Kirkwood (pictured below) accepted the award at the 2016 RICS Awards Ceremony, which took place at the Sheraton Hotel, in Edinburgh on 14 April 2016. The French-owned Chivas Brothers Ltd, part of Pernod Ricard, built the £25m Dalmunach facility on the site of a former distillery near Carron in Moray and was formally opened in June 2015 by First Minister, Nicola Sturgeon. This new Distillery on the banks of the River Spey was commissioned to replace the former Imperial Distillery on a site nestled on the banks of the river. Built using the latest innovations and environmental expertise such as heat recovery technology, the Distillery is capable of producing up to 10 million litres of spirit per year. The design set out to create a memorable building with a strong sense of place whilst remaining honest to the aesthetic of a contemporary industrial building. The plan was inspired by the shape of a sheaf of barley, reflecting the core ingredient of single malt whisky. Thomson Bethune carried our Quantity Surveying Services, working alongside Archail Norr Architects and Structural Engineers, Blyth and Blyth to assist Chivas Brothers in achieving their vision for this prestigious project. We are delighted to announce that the Dalmunach Distillery Project, submitted under the category of ‘Design through Innovation’ has been shortlisted for the 2016 RICS Awards! The Construction Design and Management Regulations (CDM) are intended to ensure that Health & Safety issues are fully considered during a project’s development, so that the risk of harm to those who have to build, use and maintain structures is reduced. In April 2015, new regulations for CDM came in to force, resulting in the CDM-Coordinator role being replaced by the Principal Designer during the pre-construction phase. The Health & Safety Executive (HSE)’s objectives behind the new regulation will mark a significant shift in the health and safety regime for procurement, design and delivery of construction projects. · Informing the client of their duties under the regulations. · Providing pre-construction information to designers, principal contractor and contractors. · Preparing a Health & Safety file and reviewing, updating and revising it as the project progresses. · Liaison with Principal Contractor to plan, manage, monitor and coordinate the construction process. · Ensuring designers have the sufficient skills, knowledge and experience to carry out the work. · Ensuring designers comply with their duties and co-operate with each other. · Assisting the client in identifying, obtaining and collating the pre-construction information. Please click here to review the Health & Safety Executive’s ‘Managing Health & Safety in Construction’ manual for more information on the changes to CDM 2015. If you would like to speak to us directly about the changes to the CDM regulations, please phone 0131 220 1828 and ask to speak to eitther David Kirkwood or Bob Jeffrey. The University of Edinburgh’s 50 George Square Renovation Project was announced as one of the RICS Scotland Annual Awards 2015 winners, under the category of ‘Building Conservation’. Thomson Bethune acted as Quantity Surveyors for this prestigious renovation project, working alongside designers, Page\Park and main contractor, Balfour Beatty. The buildings at 50 George Square were designed by Robert Matthew and Johnston-Marshall & Partners to house the Arts Faculty and were completed in 1970. They form part of the Grade A listed David Hume Tower grouping and are key examples of Scottish Modernism. The objective of the project at 50 George Square was to provide a new home for the School of Literatures, Languages and Culture. In addition, works were also carried out to the basement level of David Hume Tower to form a central teaching hub with a catered study area. This lower ground level links directly with 50 George Square, David Hume Tower, the podium level David Hume Tower Lecture Theatres and also provides pedestrian access directly to George Square. 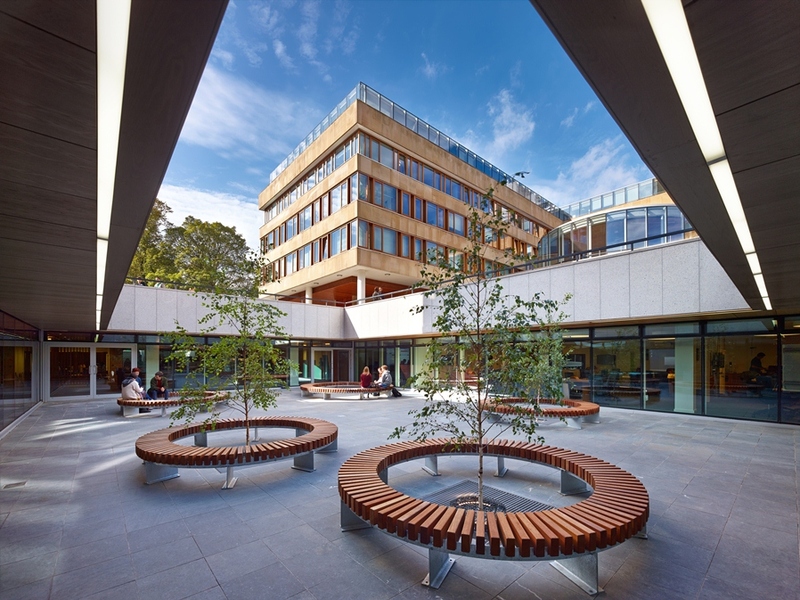 The redevelopment has allowed the area to become a vibrant hub for students and staff. The complexities of the David Hume Tower Lower Ground Teaching Hub were varied, the site is in a conservation area, Grade A listed and surrounded by other listed buildings. The surrounding buildings were still in use throughout the project and the area is a heavily trafficked route across the University Campus Central Area. The footprint of the project was tight and there were numerous structural and layout intricacies. In such an environment, undertaking consistently high standards of service delivery and a full understanding of the project were key client requirements and central to the project's successful delivery. We are delighted to be part of this achievement. For further information about this project, please call Iain Logan or Andrew Patton on 0131 220 1828.